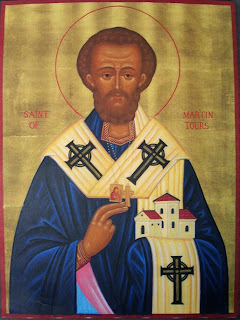 In addition to being Veterans' Day in the United States and Remembrance Day in the Commonwealth of Nations, today is Martinmas, the feast of St Martin of Tours. Martin was born in 316 in present-day Hungary. Drafted into the army at age fifteen, he found his own ideal of the Christian life hard to reconcile with the duties of military service. Eventually, he decided to be baptized and asked to be released from the army, being released when he was twenty years old. He met with Bishop Hilary of Poitiers, in France, and decided to join him in his defense of Orthodoxy against Arianism. Martin led a hermit's life outside of Poitiers, but his fame grew and a semi-monastic community coalesced around him. When the see of Tours became vacant in 371, the people of Tours insisted that Martin become their bishop. Perhaps ironically, considering his conscientious objection, Martin is a Roman Catholic patron saint of soldiers, making Veterans' Day an appropriate match of a national holiday. He is also a patron saint of beggars because of a legend which involved him dividing his cloak with his sword to give half to a freezing beggar.